I watched a very interesting program last weekend called "Britain From Above." It's a BBC series that looks at the landscape of the island from the air. The first episode shown last Sunday was on London. The BBC website has a number of clips from the show on their website. Hopefully those outside the UK can see the videos. I have included a few links within the text to the site with videos from the show. The program was able to provide an interesting contrast of present London to the past. In the late 1940s, at the end of World War II, the RAF flew a number of missions over London to record the damage to the city. Given the amount of damage to the city from the Blitz, plans were drawn up to rebuild the city completely anew. Lord Abercrombie came up with a vision of a London organized with wide streets, lots of parks, high rise apartments and highways to move cars quickly into and around the city. Now, if you've ever been to London, you will know that London is none of those things. It is narrow streets at odd angles, very few high rises, a smattering of parks but not a lot of green space and bad congestion and few highways. Not surprisingly, Lord Abercrombie's grand vision of a completely planned city never got any political traction, and thus few if any of his plans were built. 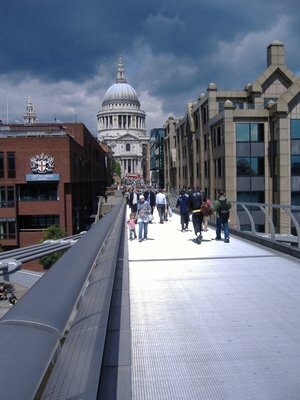 Within the "Square Mile," as the old city of London which is the heart of the financial centre, large buildings are being designed and built to fit into the irregular street scape of London, including a planning restriction that requires that sight-lines to St. Paul's Cathedral not be interfered with. To counter this restriction and still build the tallest building in the City of London at 122 Leadenhall Street. The building has become known as the Cheese Grater given it's sloping side, sloped to ensure that the sight-lines to St. Paul's are not blocked. 122 Leadenhall had a building standing at that location, which is currently being demolished. 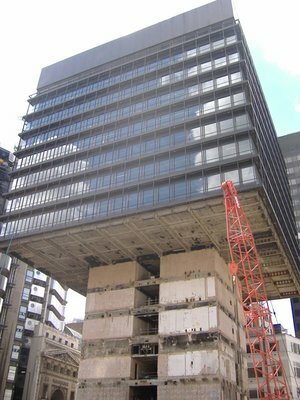 Because of the way that building was created, the building was demolished from the bottom up. You read that right. They removed the lower floors first, and worked upwards. 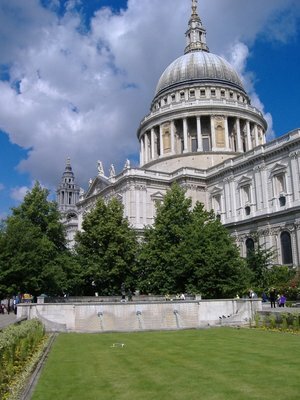 Here is a picture I took of the building when I was in London last year in August of 2007. All the floors have been removed now, and the core is now being demolished in the more traditional way of top-down. Bad news today for the future of London, though. Turns out that because of the economy going soft and demand for commercial space falling, British Land (the developers) are discussing delaying construction of the tower. This also comes upon news that the Pound Sterling is at it's lowest level in 2 years, and an economic forecast of stagnation and recession for the UK.